Is Gratitude Your Trigger for an Amazing Year? I’ve studied high achievers for decades. They all have different traits and habits that make them unique, but what I find fascinating are all the commonalities. What if having a successful year came down to just a handful of best practices? I asked thirty well known high achievers to tell me how they set themselves up for success as the New Year approaches. Super-successful people like Tony Robbins, Dave Ramsey, Chalene Johnson, John Maxwell, and Chris Brogan all let me peek into their year-end process. After studying their responses, I identified eight commonalities. Consider these best practices for getting a jump on the New Year. And Thanksgiving—which we’re celebrating this week in America—is the perfect time to get started. Why? One of the most common responses was expressing gratitude. “I enjoy taking the Thanksgiving Holiday to be thankful for all the positive things that happened over the past year, as well as assess how I can change my perspective on the negative things that happened to a healthy one,” Erik Fisher told me. Taking stock of the past year is the best way I know to set yourself up for success in the next. John Maxwell does it. Skip Prichard does it. Jeff Walker does it, too. At the beginning I mentioned I counted a total of eight different best practices from these high achievers. Expressing gratitude is just one. Reflecting on the past year is another. I share the rest in my free ebook, Achieve What Matters in 2017: 8 Strategies Super-Successful People Are Using to Accomplish More Next Year. It reveals what Marie Forleo, Andy Stanley, Lysa TerKeurst, Amy Porterfield, and other high achievers do to get clarity on what matters most, boil it all down to actionable goals, and schedule it for success in the New Year. 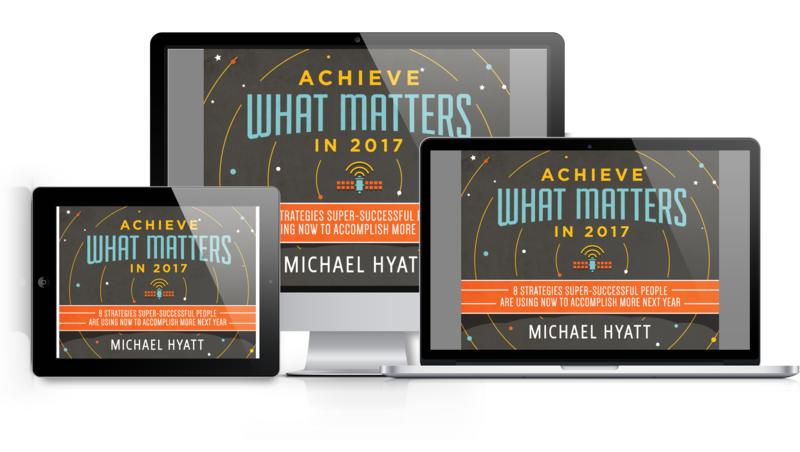 Get your copy of Achieve What Matters in 2017 by clicking below.